Globally, commercial real estate had a strong year in 2018. 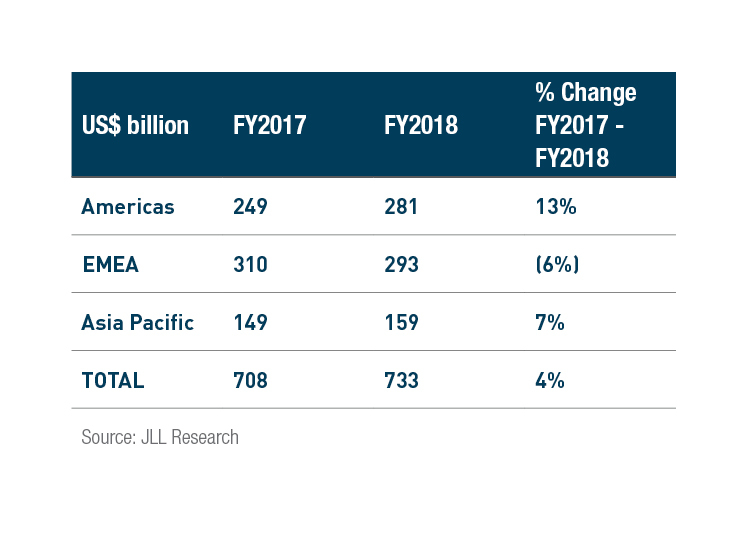 Full-year direct commercial real estate investment volumes totalled US$733 billion, which was up 4% on 2017, and represented the best annual performance since 2007. Regionally the largest market, the Americas, led the way with full-year volumes rising by 13%. After a relatively slow third quarter, Asia Pacific ended the year robustly as the full-year total climbed by 7% to a new all-time high. Europe, the Middle East and Africa (EMEA) witnessed a 6% decline in annual sales activity but was still the largest region by investment volume. Weakening sentiment in the residential market drove investors to commercial space in 2018, with a number of records broken across the sector. A$41.8 billion was invested over the course of the year, making 2018 the first $40-plus-billion year on record. This was, in large part, due to the strongest Q4 ever seen in Australia. The $16.6 billion fourth quarter was up 55% on Q4 2017’s $10.7 billion and included the $3.4 billion privatisation of Investa Office Fund. 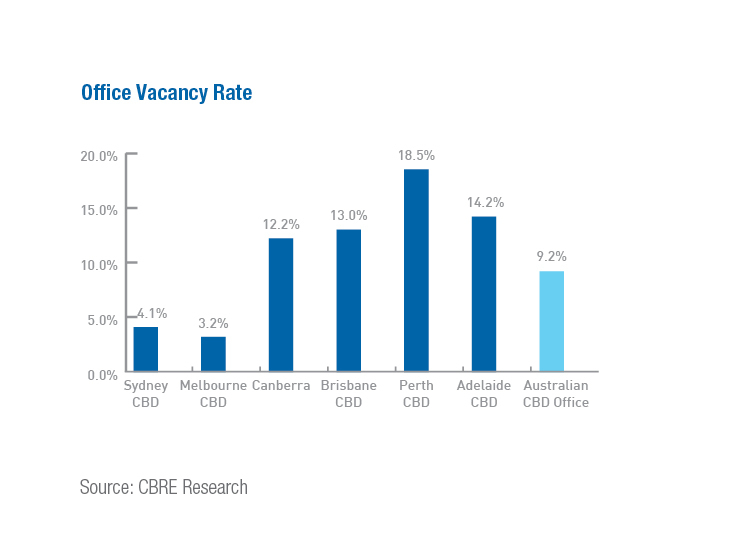 Growing demand for office space, particularly in Sydney and Melbourne, capped a strong 2018 for the sector. Annual prime effective rental growth was positive for all major cities, with Sydney (14.6%), Melbourne (7.4%) and Adelaide (5.1%) leading the way. Perth (2.4%) and Brisbane (2.1%) experienced marginal growth, but growth nonetheless. National CBD absorption increased on 2017 levels, with withdrawals, moderate demand and lack of stock all having an impact to varying degrees in different markets. 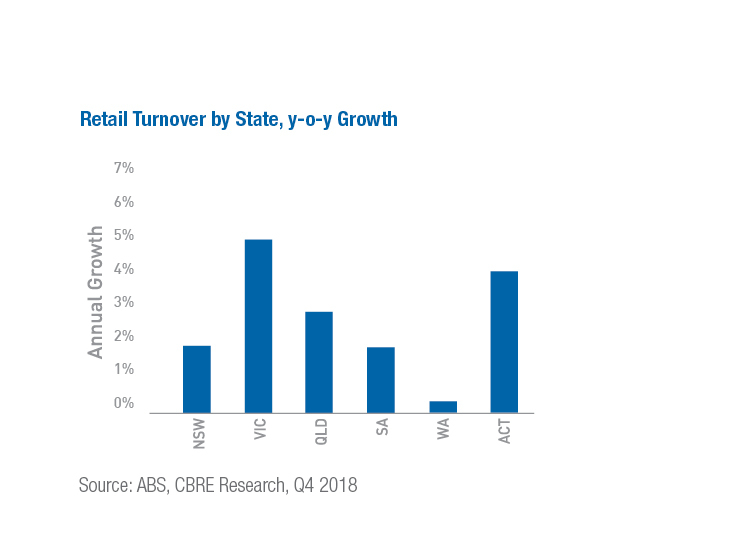 Vacancy rates in Melbourne (3.2%) and Sydney (4.1%) continue to be at cyclical lows with all other markets in double digits. Prime yields tightened across the board, varying from 4.75% in Sydney and 4.90% in Melbourne, to mid-5% in Brisbane and above 6% in all other markets. Strong demand for limited stock compressed yields in 2018, while also translating to a strong appreciation in land, rent and capital values. 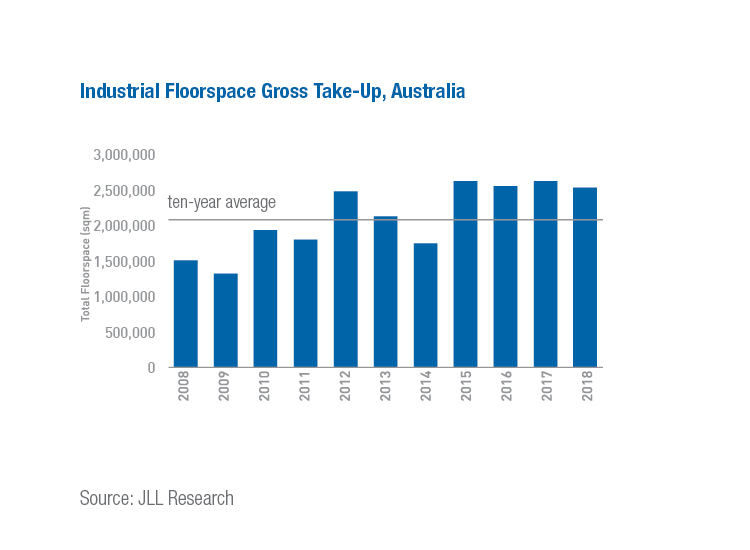 For the fourth consecutive year, gross take-up for industrial space exceeded the ten-year average of 2.1 million sqm. Long WALEs and stable returns are driving an increase in popularity for logistics amongst institutional investors, who have increased their activity in the sector over the past five years. In 2018, institutional investors made up half of all transactions above A$10 million – the seventh consecutive year in which they were the largest buyer group. Mid-last year in Insight 22, we reported that e-commerce is set to increase its share of global retail sales with logistics benefitting off the back of last-mile logistics, continued technology advancement and automation, as well as supplementary infrastructure. This still holds true, with Australia’s growth in online retail sales between 2013 and 2018 outpacing even that of the United States. Retail trade grew 3.4% through 2018, an increase on the 2.1% growth experienced across 2017. Each state experienced positive year-on-year growth, highlighted by Victoria (5.9%) and the ACT (4.9%). Despite this, transactions in the retail sector totalled A$9.4 billion in 2018, down 10% on 2017’s A$10.6 billion, and a two-tiered market has begun to emerge with landlords seeking to divest non-core assets, particularly those perceived to be at risk from falling foot traffic and increasing online sales. This trend is expected to continue throughout 2019, meaning yields for non-core assets will be more susceptible to expansion, whilst prime asset yields are expected to stay stable. 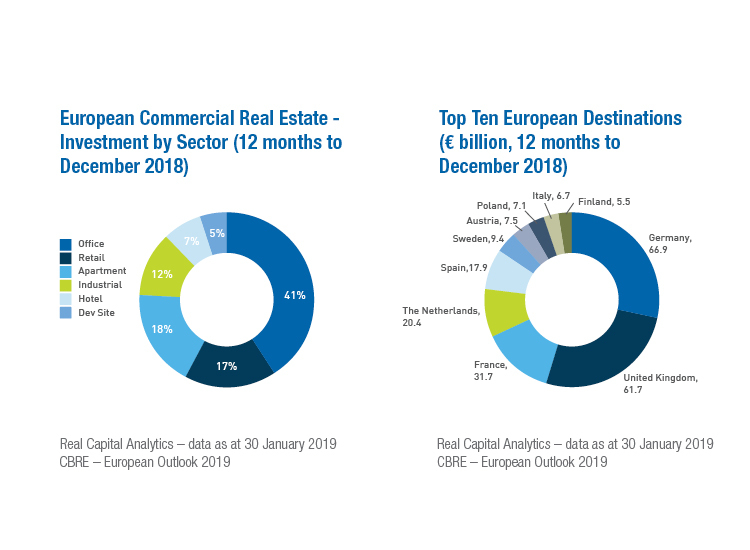 For the fourth consecutive year, 2018 saw European commercial property investment exceed €250 billion. While down year-on-year, activity across a number of markets remains close to the record highs set through 2017, and investor sentiment remains upbeat. While global uncertainties and geopolitical headwinds are on investor radars, they do not seem to be acting as a deterrent. However, as an increasing number of investors look to de-risk, core markets and long income streams become relatively more attractive. Office was the most targeted sector with 41% of all deals. Residential (18%) edged ahead of retail (17%) for second and third, with industrial in fourth (12%). In 2018, there was a 50:50 split between international and domestic capital. Asian capital is more active, particularly from Singaporean and Korean investors who continue to buy into European real estate. The rise in popularity of Germany as a capital destination continued in 2018, surpassing the UK amid Brexit uncertainty. Among the best of the rest was France, The Netherlands and Spain. Office yields are at, or close to, historic lows in the majority of European markets following sustained downward pressure. A stabilisation is largely expected in 2019. 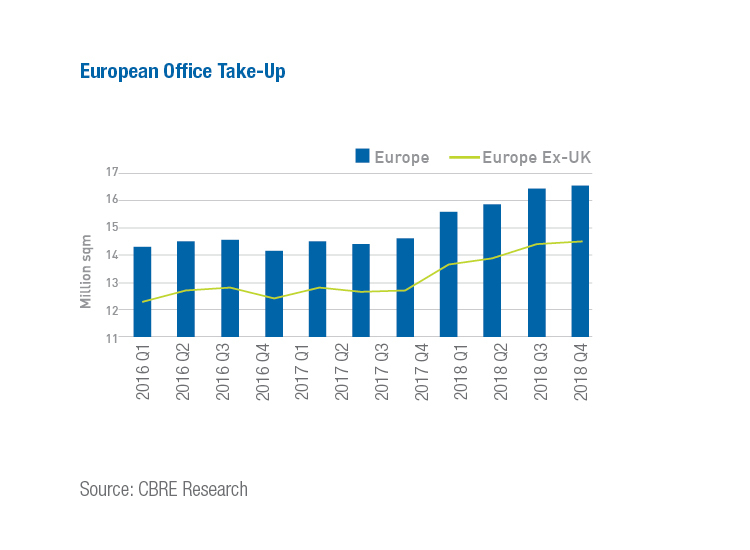 For the fifth consecutive year, the office market drew more than €100 billion in capital. 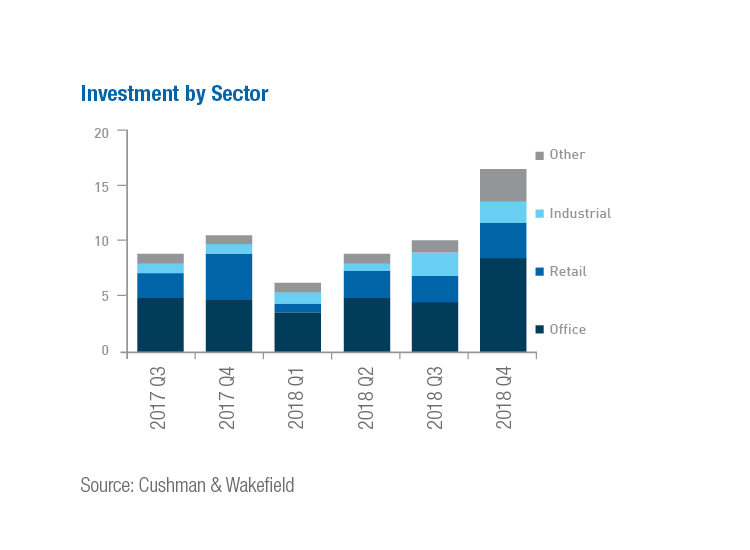 For the first time since 2015, more was spent on CBD offices than non-CBD assets, indicating where demand has focussed, and some of the risk awareness that has started to deter investors from pressing into less liquid markets at a mature point in the cycle. Office take-up growth was between 5% and 10% in 2018. This growth is expected to slow in 2019. Similarly, rent growth was 4.5% in 2018, but is expected to slow to around 3% in 2019. Moscow, Frankfurt, Berlin and Madrid were the strongest performing cities through 2018, with London and Paris beginning to experience lower rental growth as the economy slows. The industrial and logistics market continued to tighten in 2018, with year-on-year rental growth of 2.3% on 2017. Market dynamics for the sector remain strong, and are set to remain that way for the year ahead. Vacancy rates remain low for the most part, despite a steady flow of new development projects. The exceptions to this were Spain, the Czech Republic and the UK, who all witnessed a modest rise in vacancy to end the year as a result of increasing development activity. 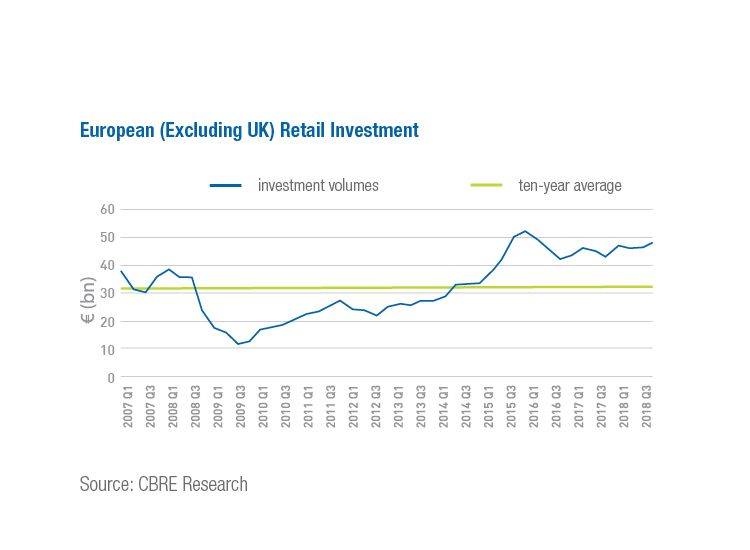 Outside of the UK, the European retail market remains well above the ten-year investment average. This largely reflects the contribution of the maturing markets in Central and Eastern Europe. However, negative sentiment from the UK is affecting distribution and reducing the number of buyers in the market. Beyond the rise of e-commerce, the UK market in particular is suffering from structural concerns, such as business costs and an over servicing of retail space. Even though these threats are less prevalent elsewhere in Europe, there is still an elevated level of uncertainty in the sector.